Bradley Cooper‘s directorial debut starts out in an immersive, claustrophobic and exhilarating opening scene where his country rockstar Jackson Maine hypnotizes a packed festival crowd in a druggie Coachella-esque haze. It sets the scene for a wild and emotional ride to come. Knowing Lady Gaga’s pedigree and her own penchant for immersive musical experiences, it would seem that the film’s tone and its talent were a match made in heaven – in some cases this is true, in others, it is not. 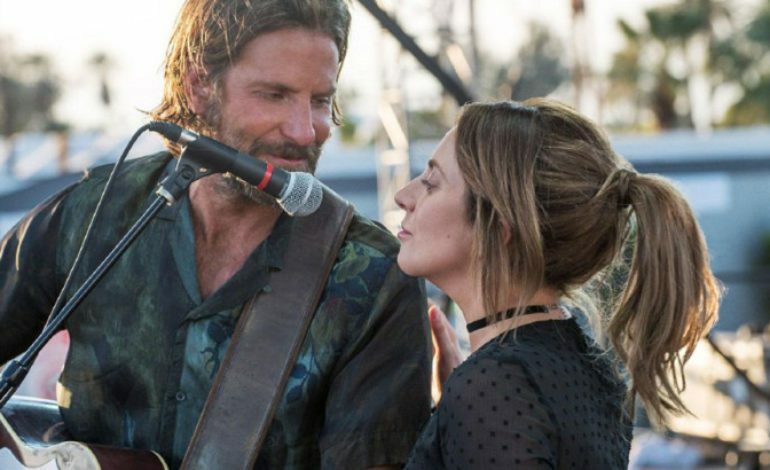 Lady Gaga, or in the film, ALLY, plays the stripped down musical ingenue to absolute perfection, and Cooper, on the other side of the coin, takes the grizzled country man, and squeezes out every possible bit of drunken charm. When the two meet by chance while Ally is performing at a drag bar, it is electric and sets the stage for a beautiful beginning to a relationship. Where the love affair heads is less beautiful, but such is life, or such is how the film would like us to feel about life. We follow Jackson and Ally’s journey from him making her an overnight success, to playing songs on his tour, to her very own pop-infused stardom and a swapping of the spotlight, all the way to their explosive end. The film’s message on the current state of the music industry is a complex and conflicted one. Jackson falls quickly in love with Ally after first hearing her hypnotic voice and then finding out that she’s a talented songwriter. When she ventures out on her own as an artist, though, and begins releasing pop singles with lyrics that reference men’s asses in their jeans, it strains their relationship. Ally, however, never takes the same offense to her new style, suggesting that maybe this (or something like it) would have been her trajectory all along, regardless of his intervention. Not to give too much away, but this song, and presumably others like it, launch her into stardom while Jackson’s career takes a dive. Whether his opinion is correct, or hers, or somewhere in between, the film is taking a stance that songs about asses are pushing out poetic lyricism as the new lauded art within the industry, whether we like it or not. It’s a subtle cynicism within the film that takes the story into murky and uncomfortable territory. What is not subtle, however, is the film’s focus on the sheer power of music. Ally’s rise to stardom as well as her and Jackson’s courtship through music is mesmerizing. Cooper’s vision is one of pure wonder for the art as he crosses between perspectives of the performer and the audience, both the entrancing and the entranced, making for a truly meaningful visual experience. Cooper borrowed Darren Aronofsky’s regular director of photography, Matthew Libatique, for his first directorial outing, and the pair mesh gorgeously onscreen. It is no surprise here, but Lady Gaga and Cooper are both deserving of praise for their performances. 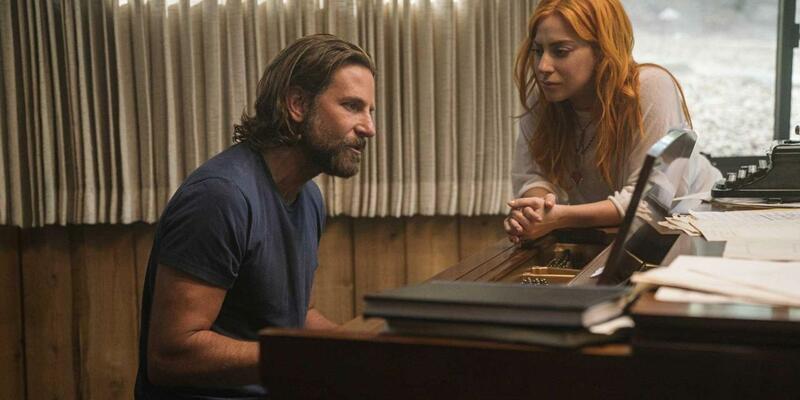 Gaga makes an incredible transformation back into a sort of every woman with star power and Cooper’s accent training wasn’t for naught – his cowboy hums are a thing of movie magic, even if we can’t always understand what the hell he’s saying. He and Gaga’s voices ebb and flow together gracefully, making the live performances feel all the more real and immersive. This film is decidedly not perfect – the story takes a weird dive about halfway through, right around the time Ally starts singing about men’s derrieres and dyes her hair a frightful red color. The beauty in the heart of the film, though, and particularly in Jackson and Ally’s musical love affair, is a lovely visual and sonic experience that will have audiences glued to their chairs. But, whether a star is, in fact, born by the end of this film is a bit unclear.